Attenuates the spots and prevents the appearance of new spots. 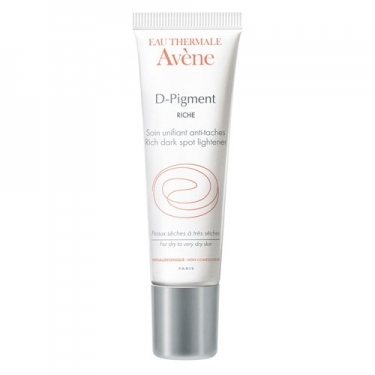 DESCRIPTION: D-Pigment Riche from Avène is an anti stains care for dry skin. It combines Mélanyde, Retinaldehyde and Vitamin E for a depigmentation and anti oxidant action. Enriched with Avène Thermal Water, which soothes and comforts, the result is a more uniform and light skin. Hypoallergenic and non-comedogenic. Without perfume. Clinically proven under dermatological control: 81% on average decrease in pigmentation confirmed by the dermatologist. * * Clinical efficacy in the application in 58 individuals. 1 application at night for 3 months. Apply at night on the affected areas (face, neck and hands).